Fodder Technologies’ controlled-environment fodder production system is a premium system aimed at owners, breeders, managers and veterinary practices worldwide. The technology can be used anywhere in the world where soil, climate, and weather conditions affect growing live crops. The system represents high standards of commercial practice in a controlled environment, and high level production techniques that are sustainable and environmentally sound. The company provides installation. education and training and ongoing support. The FodderTech fodder production system is designed to produce fodder from grain in 8 day cycles. Whilst other crops, including crops for human consumption such as wheat grass, can be grown in the FodderTech controlled environment system, it is barley (Hordeum vulgare), that appears to be particularly appropriate as fodder for all grazing animals. Fresh fodder not only contains live nutrients, it contains vital moisture. Of the different crop varieties that were germinated and tried out on livestock, barley is proving to be the most outstanding crop. The reason barley was chosen as the seed of choice for producing fodder in the FodderTech System is that on sprouting, barley seed produces high quality, live, green fodder, which provides essential elements, vitamins and minerals. Green barley is recognised as being the most nutritious of all plant foods, containing a broad spectrum of essential vitamins, minerals and amino acids in high concentrations. Young green barley leaves are 40 per cent protein and contain one of the broadest spectrums of amino acids available from any plant. These plant proteins are 90 per cent usable and easily digested and assimilated. Important enzymes, amino acids, vitamins and minerals have all been identified in green barley. 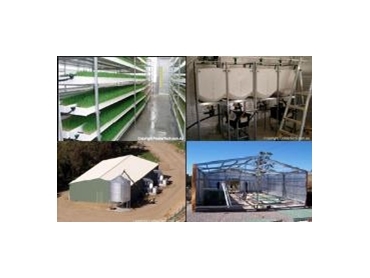 The FodderTech System produces fodder in a controlled environment that makes use of hydroponic technology to provide and control nutrient and water input to growing roots, in combination with controlling the environment (insulate and protect). The FodderTech System is housed in a fully insulated, specially designed solid steel shed construction on a concrete slab. The structure can be insured and used as collateral for financial institutions. The basic structure is designed to withstand high winds and different designs will withstand extremes of weather and climate and atmosphere (temperature and humidity). Industrial power saving and reverse cycle climate control ensures consistent, reliable growth with minimal error. The requirement for constant spraying of fodder increases the humidity in the shed or greenhouse, which is conducive to potentially fatal moulds and fungi, and wastes water. The FodderTech System delivers moisture and nutrients to the roots of the barley, removing these health concerns, water waste, and also maintaining dry walls and floors to prevent slipping. This 'Water Wise' system is fully recirculating and can convert 1kg of Barley seed into 7-8 kg of fodder in a seven day cycle. This bottom-fed system is one of the pivotal differences between the FodderTech patented process and most other existing hydroponic systems.